AirDuo™ RespiClick® is indicated for the treatment of asthma in patients aged 12 years and older. 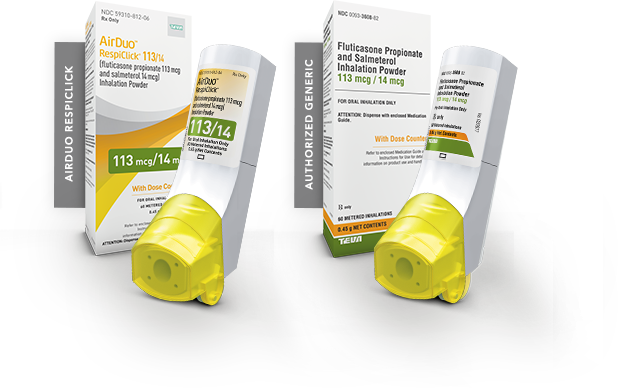 AirDuo RespiClick is only for patients uncontrolled on an inhaled corticosteroid (ICS) or whose disease severity clearly warrants an ICS/Long-acting beta2-agonist (LABA). References: 1. AirDuo RespiClick Prescribing Information. Frazer, PA: Teva Respiratory, LLC. 2. 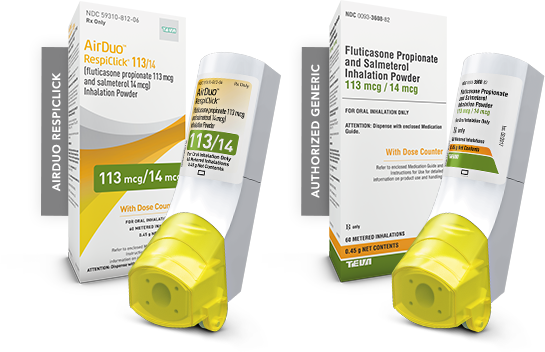 Fluticasone Propionate and Salmeterol Inhalation Powder Prescribing Information. Frazer, PA: Teva Respiratory, LLC. 3. Advair Diskus Prescribing Information. Research Triangle Park, NC: GlaxoSmithKline; February 2017. 4. AirDuo RespiClick Medication Guide. Frazer, PA: Teva Respiratory, LLC.